In 1803, a group of Newburyport investors incorporated as the Newburyport Turnpike Corporation in a commercial venture to build a straight toll road from Boston to Newburyport (the highway we call Rt. 1). The intent was to bypass Salem and promote Newburyport as a commercial destination. Proponents claimed it would cut travel time by a third compared to the old Bay Road (Rt. 1A). The Turnpike Corporation failed to be profitable and the road was turned over to Essex County in the 1850s, some of it remaining little used for decades. The road was designed for stagecoaches, and specifically, the Concord Coach manufactured by The Abbot-Downing Company which began in 1816 when Lewis Downing founded a “waggon” factory in Concord New Hampshire. In 1828 he teamed up with twenty-two year old J. Stephens Abbot of Salem, Massachusetts, who assisted in the manufacture of the “Concord Stage Coach.” By 1873 the “Abbot-Downing Company” had a payroll of over three hundred men and a manufacturing plant in Concord that covered six acres. The invention of the locomotive and the quick spread of railroads doomed the stagecoach. “The Newburyport Turnpike was remarkable for its daring projection, its persevering execution and almost total want of usefulness afterward. Great expectations had been raised to induce subscribers, but after the road had been finished all faith in it seemed to expire. It is said that the section nearest Newburyport indeed did pay tolerable earnings but the rest, neglected and disused now, looks a modern ruin for miles and miles, suggesting some greatness, but so vaguely that one can hardly guess what the greatness may have ever been. 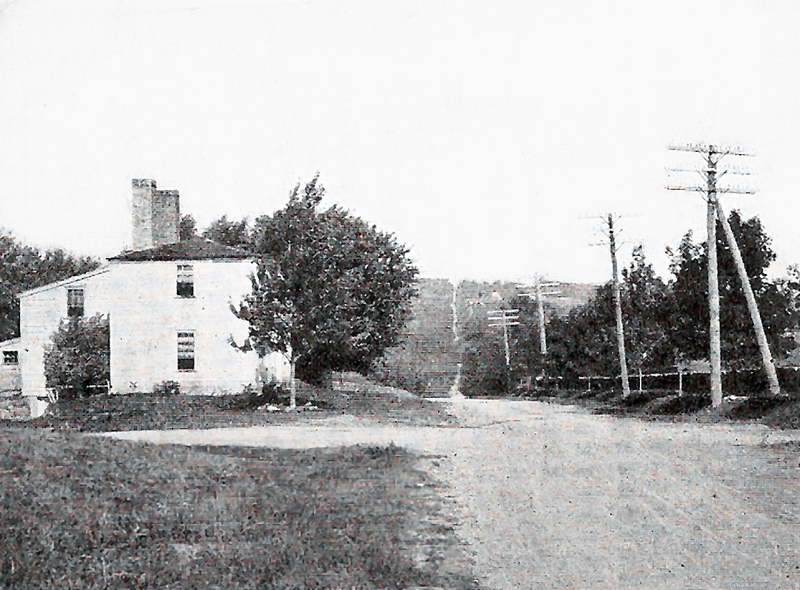 Topsfield toll house for the Newburyport Turnpike. In the distance the road rises over one of several hills. Postcard marked November, 1913, photographer unknown. The view today, junction of Salem Street and Rt. 1 in Topsfield. The photo is from the same location as the 1900 image above. This road some thirty miles in length was truly made as straight as practicable. Though they found even grades in Saugus and Lynnfield, they forced their way over the steep hills of Topsfield resolutely surmounting grades that were really frightful. Four great ridges were there passed over in close succession besides many others of less note, in utter forgetfulness that the distance over a hemisphere is equal to going around one side of its base and many times harder for any species of travel. 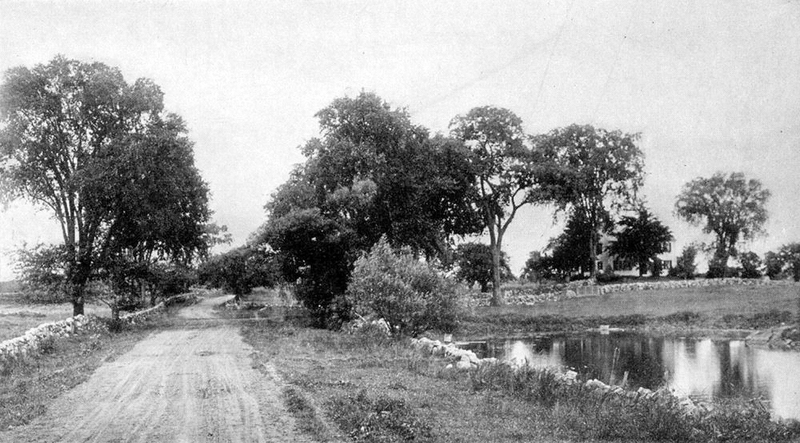 The Newburyport Turnpike finally achieved recognition when an auto route from Bangor to Miami known as the Atlantic Highway was established in 1911. 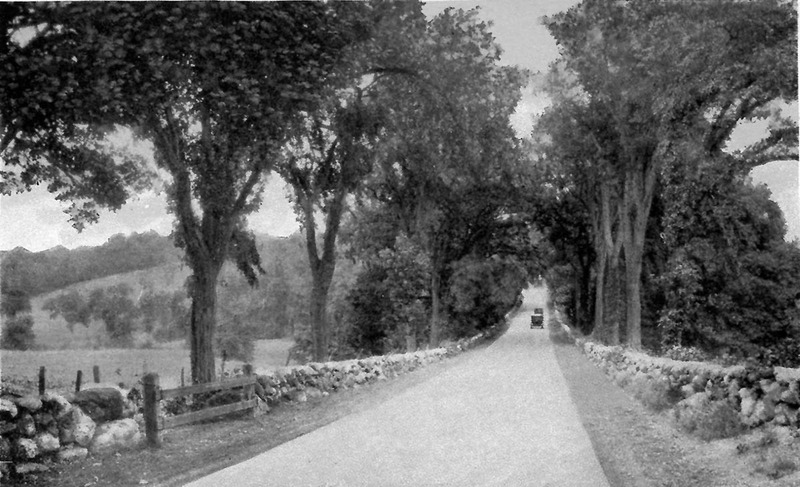 The road was widened and paved in 1922 with grass strips separating the lanes of traffic. It was renamed Rt. 1 in 1925. Drive-in theater in Saugus on the Newburyport Turnpike, 1939, photo by Arthur Griffin, provided by Digital Commonwealth. 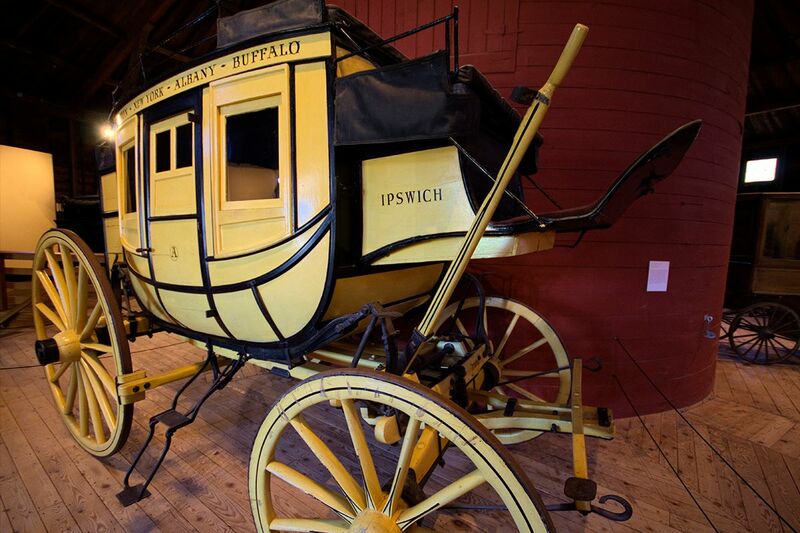 The Concord “Ipswich” coach at the Shelburne Museum was given to the museum by Joan Appleton, of Appleton Farms, Ipswich. The family monogram – an “A” in a circle – is painted on the door. I have some old photos of Appleton family members on this coach.